This peaceful setting adjacent to a horse farm yet minutes from downtown Oak Bluffs is located down a quiet lane. 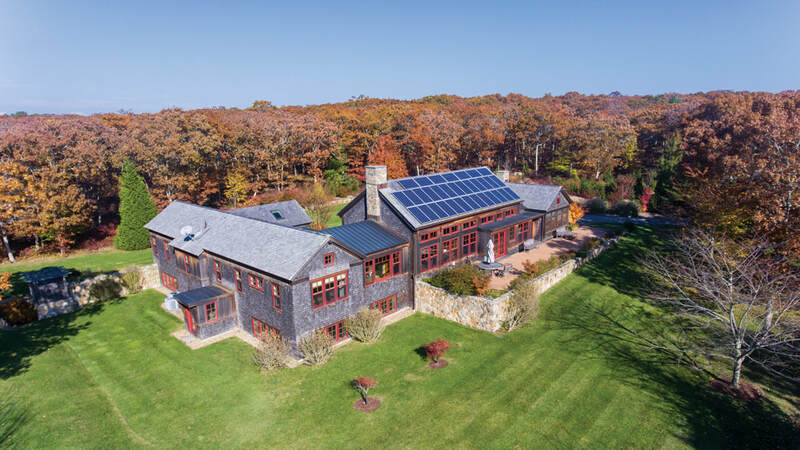 A circular stone driveway filled with evergreens and perennial grasses reveals this five-bedroom private estate on more than seven acres that was built on the principles of universal design. Built on level ground, the first floor entrances require no steps and are easily accessible by wheelchair. 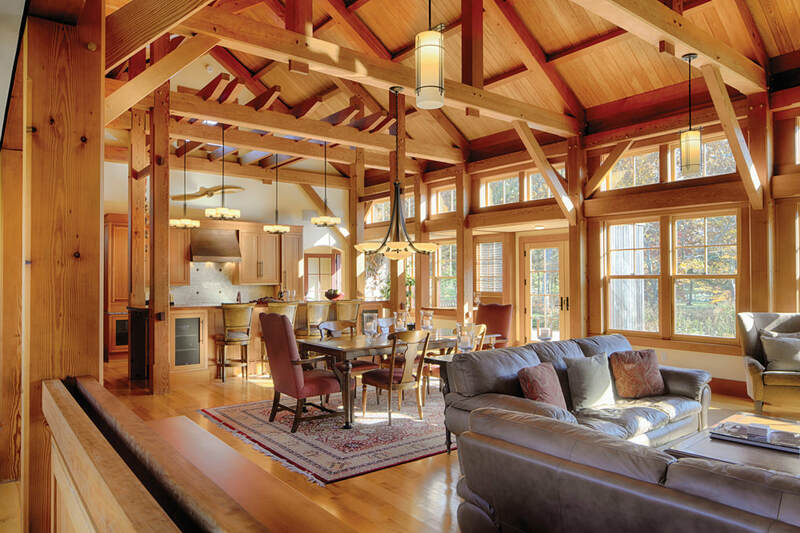 Designed by Hutker Architects and built by local timber specialist Jim Cranston of Offshore Timber, the post and beam home features a 1,000-square-foot great room where the kitchen and dining area share the living room’s two-sided garden view. Soaring ceilings and a floor-to-ceiling stone fireplace with a cherry mantle designed by Johnny Hoy are the focal points of the space. 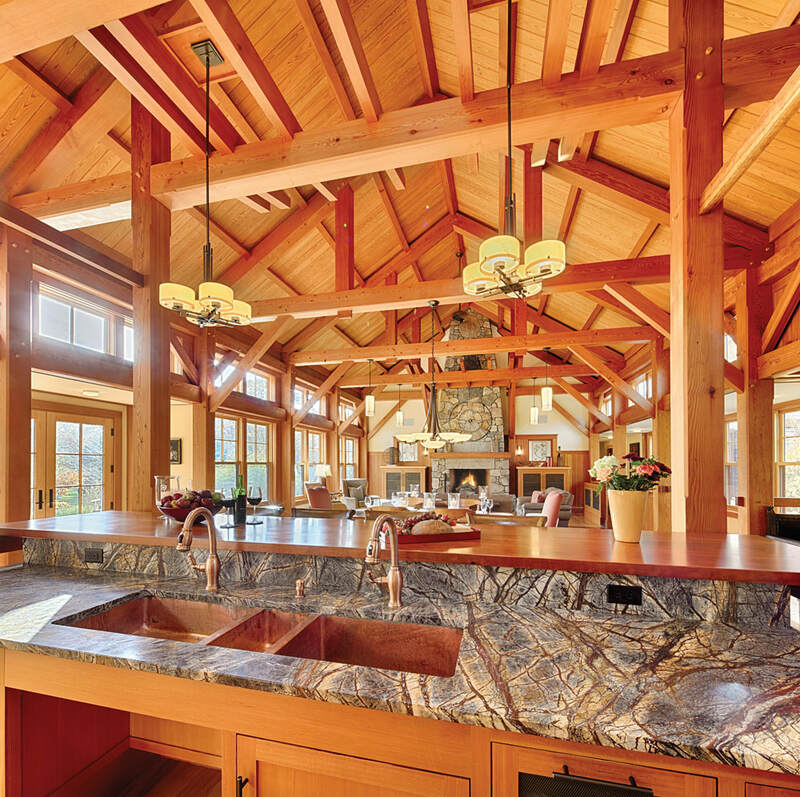 Island craftsman Ken Lobdell designed fir cabinetry in the living room and kitchen. 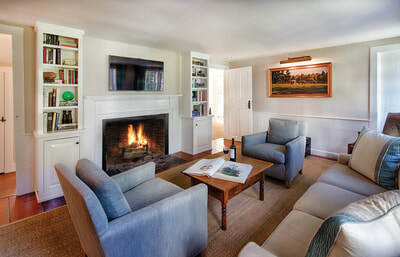 A deck off the great room overlooks stone walls, the farm and the landscaped lawn. The gourmet kitchen features an island with a cherry countertop and seating for four, a double sink with granite countertops and state-of-the-art appliances. Beyond are the pantry, half bath and a family room that opens to a screen porch with a second Johnny Hoy fireplace. Down the hall is a large office with a wood stove and built in cabinetry. The master suite includes a walk-in closet with a soaking tub, two showers and granite countertops. Two more bedrooms with a shared bath and door to a private deck are down the hallway. The owner says the multiple outdoor spaces were designed to allow privacy even when the house is filled with guests. A stairway and an elevator lead to the lower level that is partially above grade, allowing outside views through large windows. Two bedrooms share a hall bath and sitting room on one side while another bedroom, bath and laundry area are located on the opposite side. 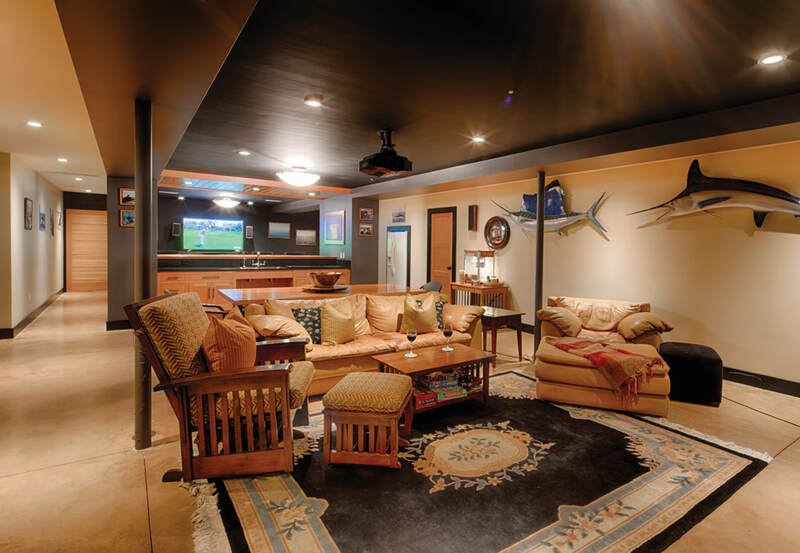 An oversized media room with a wet bar, countertop seating for 12, half bath and a 10-foot TV screen is often the scene of large gatherings for sports viewing. Beyond is the spacious utility room with storage space. 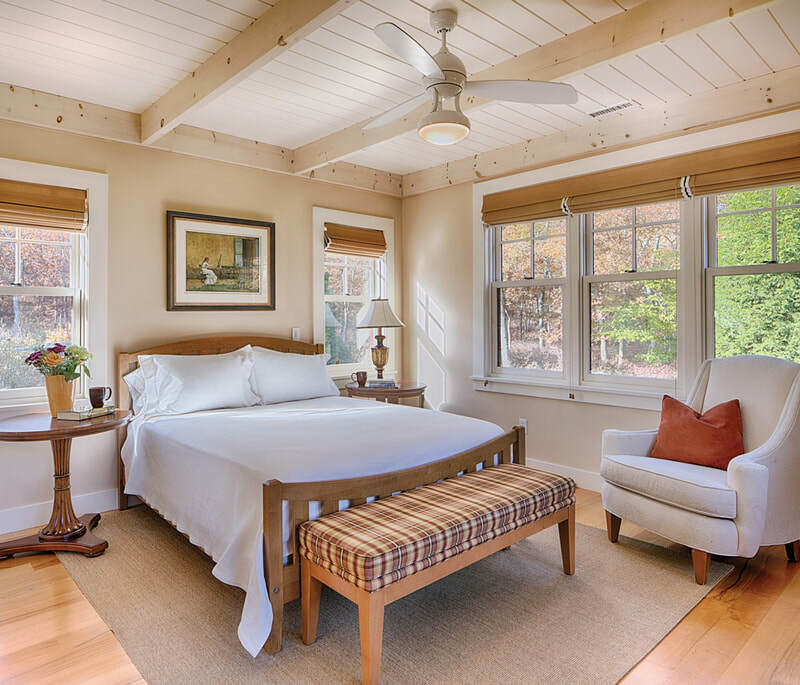 Radiant heat in the floors and heated bathroom walls make the home extra cozy in winter. Perennial plantings and specimen trees surround the house, a hobby the owner has cultivated over the years. Hundreds of acres of Land Bank property at Wapatequa Woods and Little Duarte’s Pond preserves protect the serene and peaceful location where there isn’t another home in sight, he says. 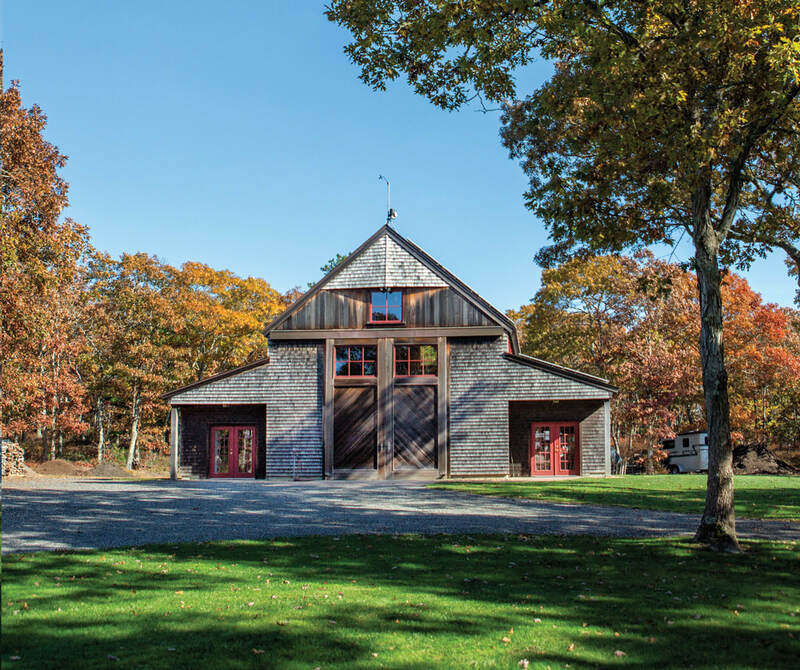 Across the driveway is the massive post and beam barn, originally built as a boat shed, which also accommodates two cars and endless storage and work space. Solar panels on the barn and house supply the property with surplus electricity. This thoughtfully designed home combines private spaces with room to spend time with friends and family while accommodating a wide range of people in a quiet setting.